This panel shows you the hierarchy of the entities in your level. They are sorted according to their z value. For example, “background” here has the lowest z depth. You can move an entity up or down by using the arrows on the right. A Group entity has its number of children written between “( )”. 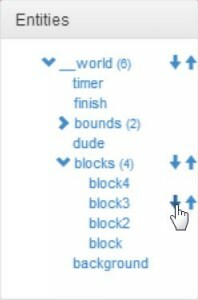 See the “blocks” group as en example. You can drag & drop entities within the panel. Note that only groups can have children.